Do you need party bags that are luxurious and hassle-free? If the title describes you, then you need to have a look at our new section - pre-filled personalised party bags. We are steadily filling up this section and are really pleased with the response it's received from customers. 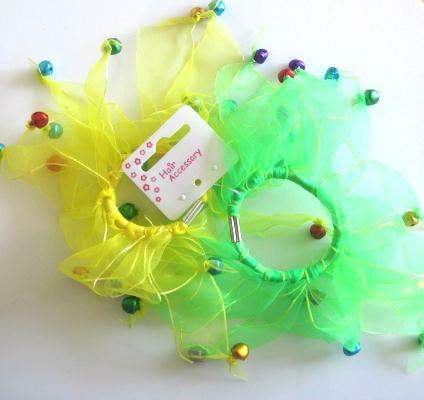 All the party bags are filled with items relating to the theme (the fairy party bag on the left is a typical expample). You can choose between a standard paper party bag, a luxury paper party bag and a luxury printed cotton bag. We will print whatever message you wish on the bag and fill it with the goodies, so it is all ready to give out. What could be easier? The range will be steadily expanding over the next few days, but take a look now and see what you think! Having 3 gorgeous sons, I don't get to buy pretty things very often, so always love it when really girly items arrive in stock! This morning I've uploaded some lovely hair scrunchies, hair slides and wooden jewellery items, which I think would be fabulous for summer party bags, and wedding party bag fillers. I particularly like the pixie ponios in the image, as they have lovely little bells on them that tinkle very gently when they move. I think it's safe to say that Spring has finally sprung, so I thought I'd give some of my product images a much-needed lift! 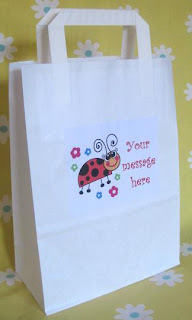 The first revamped section is now complete - the budget personalised party bags. I'm really happy with the new images because they show the bags at their best. You can see just how big they are as they have a side gusset that opens out, and of course, you can personalise them with any message you wish! The ladybird party bag on the left is particularly lovely, I think! 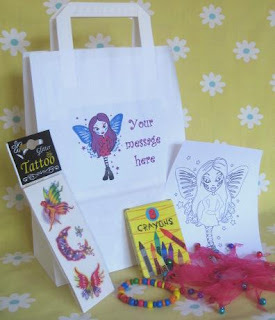 See them all in the standard personalised party bags section. Our World Cup 2010 section is now fully stocked and open for business! Whether you are planning a party, or gathering to watch the crucial matches, we have some lovely football gifts for the kids. 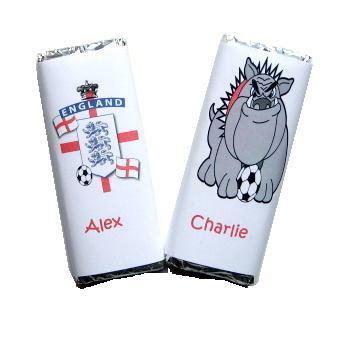 We have pre-filled, personalised World Cup football party bags, party boxes, personalised football chocolate bars, party bag fillers, red and white balloons...! You can see all these items in our World Cup section. Our England flags, and Footballing Bulldog can be found on personalised party bags, party boxes and the personalised chocolate bars pictured here. 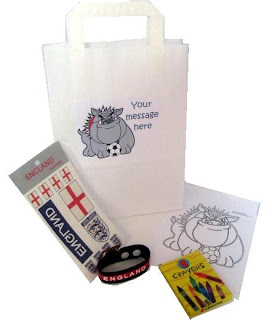 The World Cup 2010 party section will be filling up steadily over the next couple of weeks, with all you need to hold a World Cup party, or just to fill up with some football treats.